CarGurus has 9,295 nationwide LaCrosse listings starting at $1,300. The Buick LaCrosse becomes more fuel efficient for 2012, thanks to its innovative new hybrid-like eAssist powerplant, and it receives a number of updated and new features, including a new IntelliLink infotainment system, which uses Bluetooth or USB to connect the driver’s smart phone to a touchscreen radio. Components of the eAssist system cut into the 2012 LaCrosse's already tight cargo space, and some owners have noted visibility problems out the back due to thick C-pillars. In addition to its new eAssist powerplant, the 2012 LaCrosse comes equipped with a solid list of standard features, and it gets a revamped trim lineup as well, proving that Buick remains determined to stay relevant in today's competitive auto market. The plan seems to be working, since reviewers rank the LaCrosse near the top of the family sedan market segment. The LaCrosse may have its drawbacks, like its lack of cargo space and low ground clearance in eAssist trims, but its pros outnumber its cons, and it deserves a look by prospective buyers seeking a fuel-efficient, well-equipped daily commuter. After receiving a second-generation makeover in 2010, which consisted of interior and exterior updates as well as a new platform, the Buick LaCrosse midsize sedan receives an innovative new powerplant for 2012. Doing completely away with the base 4-cylinder engine of previous years, Buick introduces a new eAssist system for 2012, which becomes the LaCrosse's base powerplant. The hybrid-like eAssist consists of a 4-cylinder engine, a 6-speed automatic transmission, an electric motor and a lithium-ion battery, which work together to power the LaCrosse while delivering fuel economy numbers of up to 36 mpg. That's a 25 percent improvement in fuel economy over the past year, Buick points out, and it bests the highway numbers of such vehicles as the Lexus HS Hybrid, which tops out at 34 mpg, and the Toyota Camry Hybrid, which gets up to 35 mpg on the highway. In an effort to keep things simple, Buick also reconfigures the LaCrosse's trim lineup for 2012. Gone are the CX, CXL and CXS trims of earlier years. They're replaced by a more descriptive lineup now consisting of Base, Convenience, Leather, Premium and Touring trim levels. All come well-equipped, and even the Base trim includes such standard features as Bluetooth, a USB port, a leather-wrapped steering wheel, dual-zone climate control and a power-adjustable driver's seat. The Premium and Touring levels add all the expected upscale amenities, including leather and navigation. Outside, the 4-door, 5-passenger LaCrosse continues to display a clean, contemporary exterior design, with flowing front-to-rear lines, a sculpted hood and chrome accents. In addition, when equipped with the new eAssist powerplant, the LaCrosse's signature chrome waterfall grille includes lower grille shutters, which open and close automatically to reduce air drag, enhance engine cooling and optimize aerodynamics. On the negative side, numerous owners have reported that, due to underbody components in eAssist trims designed to improve aerodynamics, the LaCrosse has a low ground clearance, causing the bumpers to sometimes scrape against the ground when pulling into driveways or parking lots, resulting in expensive repairs. Other standard exterior features for the LaCrosse include composite halogen headlights with auto on/off, daytime running lights and heated power exterior mirrors. The Leather, Premium and Touring trims also get foglights, while the Touring comes equipped with HID headlights. 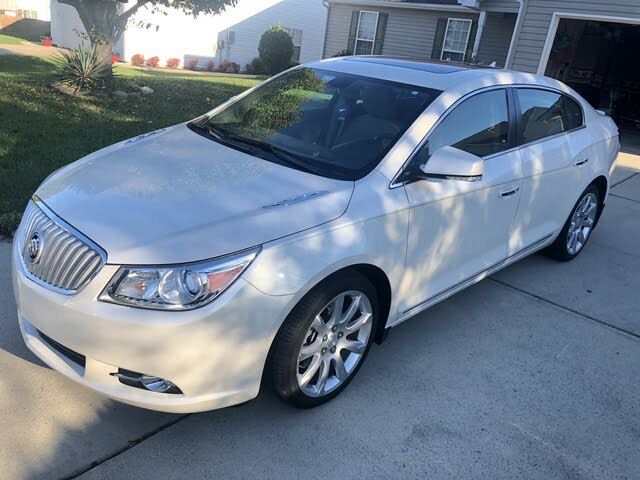 With all this to offer, the 2012 Buick LaCrosse becomes a truly viable option for buyers seeking a classy and comfortable family sedan. 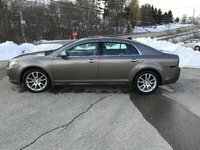 Competitors include the Ford Taurus, the Chevy Impala and the Chrysler 300, as well as midsize and large sedans from Toyota, Honda and Hyundai. With the 2012 updates, the LaCrosse becomes even more attractive and even more competitive. The biggest news for 2012 remains the LaCrosse's new eAssist base powerplant, which Buick refers to as a light electrification system. At the core of the innovative system is a 2.4-liter Ecotec 4-cylinder, direct-injection engine, which mates to a 6-speed, electronically controlled automatic transmission. The eAssist system also includes a 15-kilowatt motor-generator unit and a 115-volt, air-cooled lithium-ion battery. The gas engine provides power under normal operation, while regenerative braking charges the lithium-ion battery, which provides an electrical boost of power when required during acceleration, passing or aggressive maneuvers. In addition, an engine function shuts down fuel delivery when decelerating, and a stop/start feature shuts down the engine when idling to additionally conserve fuel. The electric motor kicks in when the gas engine shuts down, resulting in smooth acceleration from a full stop when the driver steps on the pedal. Working together, the various components of the eAssist powerplant produce 182 hp and 172 lb-ft of torque, and deliver fuel economy numbers of 25/36 mpg. In addition, the system includes an ECO gauge on the instrument panel, which assists the driver in achieving maximum fuel efficiency. According to testers, the eAssist system provides plenty of low-end torque and good acceleration off the mark, though some find top-end power lacking. In fact, according to one tester, the LaCrosse actually makes the 0-60 sprint 0.2 seconds faster than the previous version. The stop/start system works fairly seamlessly, and the electric motor and battery don't interfere with the driving experience, working effortlessly in the background. The eAssist system comes standard in LaCrosse Base and Convenience trims, while it's optional in the mid-level Leather and Premium trims. Buick also offers an updated 3.6-liter SIDI V6 engine with direct injection and variable valve technology, which also is available as an option on the Leather and Premium trims and comes standard in the top-level Touring trim. Thanks to a number of improvements, including a new cylinder head design, improved intake port design, a new fuel pump and optimized-flow injectors, the updated V6 now pumps out 303 hp, an increase of 23 over the previous V6. Torque tops out at 264 lb-ft. The V6 links to the same 6-speed automatic transmission, which comes standard across the line. Despite the additional horsepower, fuel economy numbers for the V6 remain unchanged from last year at a relatively decent 17/27 mpg. The Flex Fuel-capable V6 runs on both regular fuel and E85 ethanol fuel. On V6 trims, buyers can add an available intelligent all-wheel-drive (AWD) system, which provides full-time function. The AWD system integrates with the vehicle's electronic traction control system, monitors speed and wheel slippage, and distributes torque accordingly to ensure optimal stability on all types of road surfaces. Buicks have long been known for delivering a plush, comfortable ride that at times turned floaty. However, with the LaCrosse, the automaker has taken steps to reduce some of the floatiness and provide a more precise, controlled ride. Although it's not a sport sedan in the European tradition, the LaCrosse behaves surprisingly well around town and in tight corners, with an agile, competent feel. Trims with the eAssist system receive electric power steering, while V6 trims get a hydraulic system that provides better overall feedback. The hydraulic system also includes variable effort, delivering greater steering assistance at lower speeds. The regenerative brakes in eAssist trims provide a relatively natural and confident feel, which isn't always the case in other hybrid vehicles, testers note. The LaCrosse rides on a 4-wheel independent suspension with MacPherson struts in the front and a 4-link configuration with sound- and vibration-suppressing mounts in the rear. The Touring trim comes with an upgraded suspension that includes real-time damping and Sport Mode Selectivity, which monitors road conditions and makes adjustments in milliseconds to ensure a smooth, stable ride. Trims with the eAssist system receive 17-inch machined alloy wheels, while the Touring gets 19-inch machined alloy wheels. The Leather and Premium trims are available with a number of 17-, 18- and 19-inch wheels. Buick makes a few interior updates to the LaCrosse for 2012. Dual-zone climate control, Bluetooth and a USB port for the audio system are now standard features across the line. The automaker also adds a color high-resolution driver information center. In addition, buyers can now add an optional rear-view camera as an individual item, separate from the navigation package. Buick also introduces a new IntelliLink system, which comes standard on all trims. The voice-activated system enables passengers to integrate their portable devices with the car's infotainment system, which includes an 8-inch, high-resolution touchscreen display. Drivers can also use the system to manage the vehicle's 7-speaker audio system, which includes SiriusXM satellite radio, a CD player and an auxiliary port. On the Touring trim, the audio system upgrades to a 11-speaker Harman Kardon Matrix Surround Sound system. A flowing design swoops around the cabin, from the dash to the sides, accented by ambient lighting and chrome and woodgrain trim. Gauges are large and easy to read, and the cabin's controls are easy to identify and operate, although some testers have noted issues with the navigational system's controls. Passengers will find plenty of legroom and headroom in both the front and rear seats, which are comfortable and supportive. Cloth upholstery comes standard on the Base and Convenience trims, while the Leather and Premium trims get leather upholstery. The Touring adds perforated leather upholstery. An 8-way power-adjustable driver's seat comes standard on all trims, while all trims except the Base also get a 4-way power-adjustable passenger seat. For 2012, the Base trim comes well-equipped with such additional features as dual-zone automatic climate control, remote keyless entry and a leather-wrapped steering wheel with audio and cruise controls. The Convenience adds an auto-dimming inside rear-view mirror and power lumbar for the driver's seat, while the Leather also includes heated front seats. The Premium includes a rear-vision camera, ventilated seats and push-button entry, while the Touring also includes a navigation system with an 80GB hard drive. Cargo space in the La Crosse's trunk remains tight, checking in at 13.3 cubic feet in V6 trims. However, trims equipped with the eAssist system offer only 10.9 cubic feet, since the battery is located in the trunk and cuts into storage space. The 2012 LaCrosse was named a Top Safety Pick by the IIHS, thanks to its top ratings of Good for protecting passengers in all types of crashes, including frontal, side-impact, rear and rollover. Similarly, the NHTSA awarded the LaCrosse a top rating of 5 out of 5 stars. GM's StabiliTrak electronic stability control system comes standard on the LaCrosse, along with traction control and antilock brakes with brake assist and electronic brakeforce distribution. Six airbags also come standard. In addition, the standard OnStar system offers a number of safety features, including emergency services, crisis assist, remote door unlock and vehicle diagnostics. Owners have mixed feelings about the LaCrosse, despite its improvements for 2012. Many owners like the LaCrosse's smooth ride, comfortable interior and overall good value, but others have problems with visibility issues, out both the front and the back. In addition, the low ground clearance of eAssist trims is causing headaches for some owners, since underbody panels designed to improve aerodynamics are scraping against the ground, causing damage and requiring repairs. In addition, some owners say the LaCrosse is noisy, in part due to engine noise, but others find the cabin quiet. Overall, the LaCrosse handles well, owners say, and they like its many features and build quality. Finally, taller owners report that headroom is tight for them inside the LaCrosse's cabin. 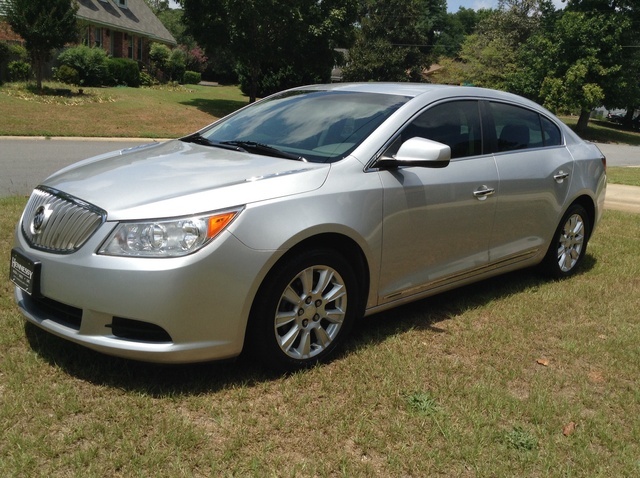 What's your take on the 2012 Buick LaCrosse? Users ranked 2012 Buick LaCrosse against other cars which they drove/owned. Each ranking was based on 9 categories. Here is the summary of top rankings. 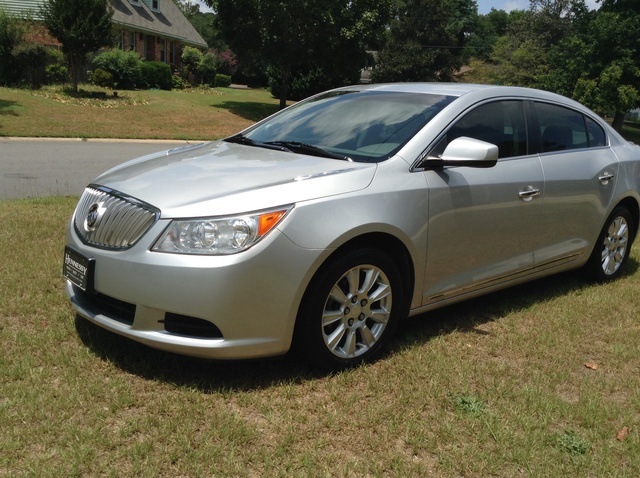 Have you driven a 2012 Buick LaCrosse? I replaced the battery now the car will start but will not come out of park and the key will not come out.